Catch Power is a hot water diversion device that uses excess solar which would usually go to the grid to heat hot water. It is the most advanced solar power diverter and a true $$$ saver! You can increase your dollar savings each year! 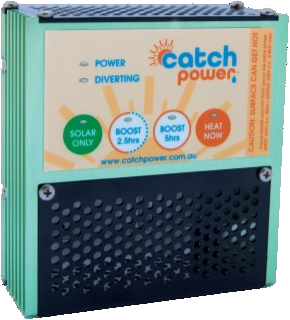 Curious to know more about Catch Power and how it can help you save $$$? Just fill out the form below and we'll send you the information right away. “Overall, I’m extremely happy with the system and I use it to monitor how much electricity is being used and when to juggle any high usage items, like the dishwasher for instance. It takes about 2.2 at its peak so I always make sure we are drawing enough to cover it before it goes on. On low light days, I just wash up myself so I don’t use power otherwise needed for water heating. I now detest using electricity from the grid (!) so I keep quite a watch on what’s being drawn from the sun and what’s being used throughout the day. I love CATCH! It will be interesting with all the lessons learned during summer to see how I can better adapt to winter this year, but I’m positive there will be a big change in efficiency in any future report you might send, especially if it includes the coming winter.”. Enjoy Free Hot Water For Your Home!